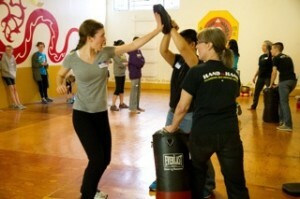 Our founder, Coleen Gragen, began teaching self-defense at Hand to Hand over 35 years ago so that women and girls could learn to assess potentially unsafe situations in order to interrupt harassment, intimidation and violence. In her honor, we are offering free (donations accepted) self-defense workshops this October. During the 3-hour workshop, participants will practice practical self-defense strategies through verbal, physical and emotional exercises in a safe and supportive environment. Saturday, October 6th, 2018 from 1-4 pm. Sunday, October 7th, 2018 from 2-5 pm. We, at Hand to Hand, have seen intolerable actions encouraged following the recent election. We recognize that our friends, families, communities and ourselves may now be targets of overt and covert hate speech and actions. In continuation of our thirty-seven year, to date, commitment to safety and positive social transformation, Hand to Hand offers free self defense and self-empowerment classes throughout this and the upcoming year. The focus of these classes will include learning to be allies to those in our community who may feel at risk, practicing de-escalation skills, expanding safety awareness, safe by-stander intervention strategies, and learning physical self defense techniques to implement if needed. Classes will be flexible in order to meet the needs of attendees and or specific community groups. If you feel unsafe and would benefit from participation in a class at this time, please register. Join us in creating a community and a world for all people to feel valued, respected, and safe. * Note: Additional workshops are being planned throughout the year.